Saint Clement I was a bishop of Rome from 88 to 99 C.E. Also called Clement of Rome and Clemens Romanus, he was the fourth pope according to Catholic tradition. A letter attributed to him, written to the church at Corinth, is the first document indicating that the Roman church intervened in the affairs of neighboring churches to provide instruction on organizational matters. Critics point out that letter is anonymous and that the term "pope"—and the attributes presently associated with this office—did not yet exist in Clement's day. Clement of Rome is considered one of the Apostolic Fathers, and the letters attributed to him are important sources of information about the early church. However, a large body of works traditionally thought to be written by him are now universally recognized as mistakenly attributed. His martyrdom, by drowning while weighted down by an anchor, is also controversial, as his story seems to have been confused with that of Flavius Clemens, a slightly later saint. Clement I is mentioned in the Roman Canon of the Mass. He is commemorated as a martyr by virtually all Christian traditions that honor saints. His feast day is November 23 in the West. In the east he is remembered on November 24 or 25. Tradition identifies Cement I as the Clement mentioned by Saint Paul in Philippians 4:3. He may have been a freedman, a former slave of Titus Flavius Clemens, who was consul with his cousin, the Emperor Domitian. The Shepherd of Hermas (Vision II. 4. 3) mentions a Clement, whose office it was to communicate with other churches. This function has been adduced to support Clement's authorship of the letter to the church at Corinth, Greece, which is ascribed to him in the collection of early Christian literature known as the Apostolic Fathers. The Liber Pontificalis supports the further belief that Clement of Rome had personally known Saint Peter, and states that he wrote two letters which have been preserved. However, the second letter, 2 Clement, is now generally not thought to belong to him, and the authorship of 1 Clement is debated. Liber Pontificalis further states that Clement died in Greece in the third year of Trajan's reign, or 100 C.E. Questions also exist as to Clement's "papacy." First, what was the nature of his office? Second, who preceded him in that office? The First Epistle of Clement does not claim internally to be written by Clement, but by an anonymous person acting on behalf of the Roman church to the church at Corinth. Its purpose is to object to the removal of certain presbyters (elders) of Corinth, an action it considers unjustified. Whether there was only a single bishop at Rome at this time is debated. It may be that the writer is himself a presbyter or one of several bishops (overseers) who also acted as the church's secretary. If he were the reigning bishop, it seems likely that he would refer to himself as such or signed the letter by name. The attribution of the letter to Clement is thus traditional, but is recognized in several second-century church sources. The second question relates to how many persons, if any, intervened between Peter and Clement as "pope." 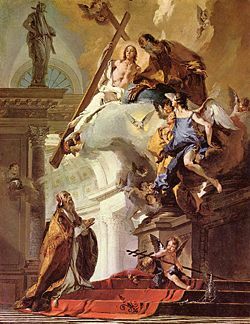 Tertullian and Jerome both indicate that Clement was ordained directly by Saint Peter as his successor in Rome, although Jerome was also aware of other traditions. Several sources record traditions that Clement was preceded by Peter, Linus, and Cetus/Anacletus. Church tradition today holds that Clement was indeed the fourth pope. The Holy See's Annuario Pontificio (2003) cites a reign from 92 to 99. Little is known of Clement's ministry other than the writings attributed to him, and these are disputed. Early sources indicate that he died a natural death, but later tradition holds that he was martyred. Modern critics think it likely that the story of his martyrdom came about by confusing his death with that of his namesake, the martyred Roman consul Flavius Clemens, a saint of the Orthodox Church. The tradition of Clement's martyrdom relates how he converted the courtier Sisinnius and his wife Theordora by miraculous means. More than 400 persons of rank soon followed. The Emperor Trajan retaliated by banishing Clement to the Crimea, where he miraculously slaked the thirst of 2,000 confessing Christians. Many people of the area were soon converted, and 75 new churches were founded. Trajan, in consequence, ordered Clement to be thrown into the sea with an iron anchor. However, the Catholic Encyclopedia admits that this story cannot be older than the fourth century. About 868, Saint Cyril, on the way to evangelize the Khazars, discovered some bones in a mound, and also an anchor. These were believed to be the relics of Clement. They were carried by Cyril to Rome, and deposited by Adrian II with those of Saint Ignatius of Antioch in the high altar of the Basilica of Saint Clement. Other relics of Saint Clement, including his head, are claimed by the Kiev Monastery of the Caves in the Ukraine. In art, Saint Clement can be recognized as a pope with an anchor or fish. Sometimes he is also pictured with a millstone, relating to his reported imprisonment in a stone quarry; keys, relating to his position as pope; a fountain, which miraculously sprung forth while he said Mass; or with a book, representing his writings. He is also shown lying in a temple in the sea. The Mariner's Cross is sometimes referred to as St. Clement's Cross in reference to the way he was reportedly martyred. Clement is perhaps best known by his letter to the church at Corinth, often called 1 Clement. The letter is particularly significant in Catholic ecclesiology in that it demonstrates the Roman church's early role in guiding the conduct of other churches. The letter was widely read in the early Christian churches and is included in some early manuscripts as scripture, along with the letters of Paul. A second epistle, better described as a homily, has also been traditionally ascribed to Clement and is included in his name in the Apostolic Fathers. However recent scholars date the letter to the second century and challenge Clement's authorship. Two "Epistles to Virgins," which were preserved in Syriac, the Greek originals being lost. They were known in the fourth century to Epiphanius, who speaks of their being read publicly in the churches. Five letters attributed to Clement are found in a body of literature known as the Pseudo-Isidorian decretals. The first two are supposed letters of Clement to James. The other three are apparently the work of Pseudo-Isidore in Clement's name. Also ascribed to Clement are the "Apostolic Constitutions," "Apostolic Canons," and the "Testament of Our Lord," as well as other works. Clement is also the hero of an early Christian romance or novel that has survived in at least two different versions, known as the Clementine literature. Here he is clearly confused with Domitian's cousin Titus Flavius Clemens. This large body of literature includes discourses involving the apostle Peter, together with an account of the circumstances under which Clement came to be Peter's traveling companion, and of other details of Clement's supposed family history. This romance has come down to us in two forms: one form is called the Clementine Homilies, which consists of 20 books and exists in the original Greek; the other is called the Clementine Recognitions, for which the original Greek has been lost, but exists in a translation made by Rufinus (died 410). Clement of Rome is one of those persons whose legacy seems much larger than his historical person. Little is known of the "historical Clement," but the body of literature attributed to him is significant, and the story of his martyrdom, though probably confused with a later Saint Clement, made him one of the most famous early popes. Yet, even the term "pope," does not seem to truly apply, for the situation in Rome at the time seems to have involved several bishops rather than one, and we cannot even be sure that 1 Clement—the letter he supposedly wrote to the Corinthians—was even written by him. Nevertheless, Clement I remains an important figure in church history. He may indeed have been a hearer of Peter who went on to become a leader of the Roman church. He has been, and continues to be, venerated as a martyr; and the literature ascribed to him is still much studied by theologians and church historians. His supposed letter to the Corinthians is of immense significance in church history, as it is the most ancient source demonstrating Rome's sense of entitlement to intervene in the affairs of other churches. ↑ "Writers of the 3rd and 4th centuries, like Origen, Eusebius, and Jerome, equate him, perhaps, correctly, with the Clement whom St. Paul mentions (Phil. 4:3) as a fellow worker. "—Kelly, The Oxford Dictionary of Popes (Oxford University Press, 1985), 7. 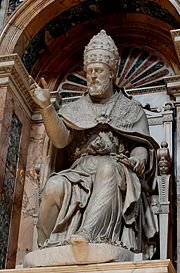 History of "Pope Clement I"
This page was last modified on 31 March 2019, at 22:47.